Take a trip to Bird-in-Hand, Pennsylvania, where you'll meet the women of the Kauffman Amish Bakery in Lancaster County. As each woman's story unfolds, you will share in her heartaches, trials, joys, dreams ... and secrets. You'll discover how the simplicity of the Amish lifestyle can clash with the 'English' way of life---and the decisions and consequences that follow. Most importantly, you will be encouraged by the hope and faith of these women, and the importance they place on their families. 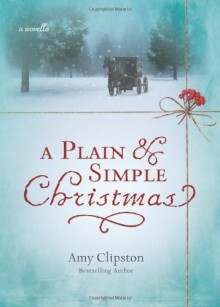 In the tradition of her widely popular Kauffman Amish Bakery series, author Amy Clipston tells the tale of Anna Mae McDonough who was shunned by her family four years ago when she left her Amish community in Lancaster County, PA, to marry an 'Englisher' (non Amish) man and move with him to Baltimore. Now, eight months pregnant when her first child, she longs to return home for Christmas to reconcile with her family, especially her stern father, who is the religious leader for her former Amish church district. So Anne Mae writes a letter to Kathryn Beiler, her brother's wife, to enlist her help. Kathryn asks her husband, David, if she should arrange Anna Mae's visit. David cautions her that a visit would cause too much stress in the family and instead suggests they visit Anna Mae and her husband in the spring. However, Kathryn arranges the visit anyway, believing in her heart that it's God's will for the family to heal. When Anna Mae arrives in Lancaster for Christmas, the welcome she receives is nothing like what she had hoped for. A book filled with love, the pain of being separated from one's family, and the determination to follow God's will regardless of the outcome, A Plain and Simple Christmas is an inspiring page-turner that will keep you guessing what happens next ... right to the very last page.